In 1922, Francisco Torres arrived in New York on a steam ship from his hometown of Puerto Plata, Dominican Republic, at the age of sixteen. Despite being an unaccompanied minor, he convinced immigration authorities to allow him to enter the United States by speaking the fluent English he learned from a native Virgin Islander living in Puerto Plata and revealing the $300 he had in his pocket. With his sights set on building his fortunes, Francisco Torres gradually transformed himself into Frank Rebajes. He adopted his mother’s last name of Rebajes, which he believed had a more interesting air, and in New York, he soon became known as “Frank” among his inner circle of artists, writers, and intellectuals. While living in a friend’s basement, Rebajes began transforming cans and scrap metal into animal shaped sculptures using the everyday tools his friend had lying around. In 1932, he displayed these works on an ironing board at the Washington Square Park Outdoor Festival and caught the eye of Juliana Force, the first director of the Whitney Museum of American Art, who purchased the entire collection for $30. Rebajes used the money to open his first shop in Greenwich Village—a four-foot wide space between two buildings with an improvised roof and a dirt floor. There he began developing what would become his emblematic line of copper jewelry, which was an accessibly priced collection inspired by cultural references, Modern art, and the natural world, as seen in this whimsical brooch in the shape of a lobster. Rebajes believed the greater public deserved to have well-designed and affordable objects, which is why everything he made sold for less than $10. His jewelry quickly gained popularity and in the late 1930s, his work was included in exhibitions at the Metropolitan Museum of Art, the Brooklyn Museum, and the 1939 New York World’s Fair. With his newfound success, Rebajes upgraded to larger storefronts in Greenwich Village, until in 1942, he settled in an expansive space at 355 Fifth Avenue called Rebajes Jewelry and Gifts. Designed by Puerto Rican architect José Fernández, the store boasted an avant-garde interior with an S-shaped counter suspended from the ceiling as its centerpiece. The store reflected the Modernist principles that were taking hold at the time and featured subdued colors, gray marble, pickled oak, and bronze trim. Rebajes’s atelier also grew to include 100 artisans; yet, despite the growth of his business he continued to design and create prototypes for all the works himself. Copper made up the majority of the production, however, silver, gold, semi-precious stones, enamel, and even found objects such as twigs or machine parts were used on occasion. At the workshop, the most important pieces were hand produced, while the majority of the jewelry was cast or die stamped and then hand assembled. 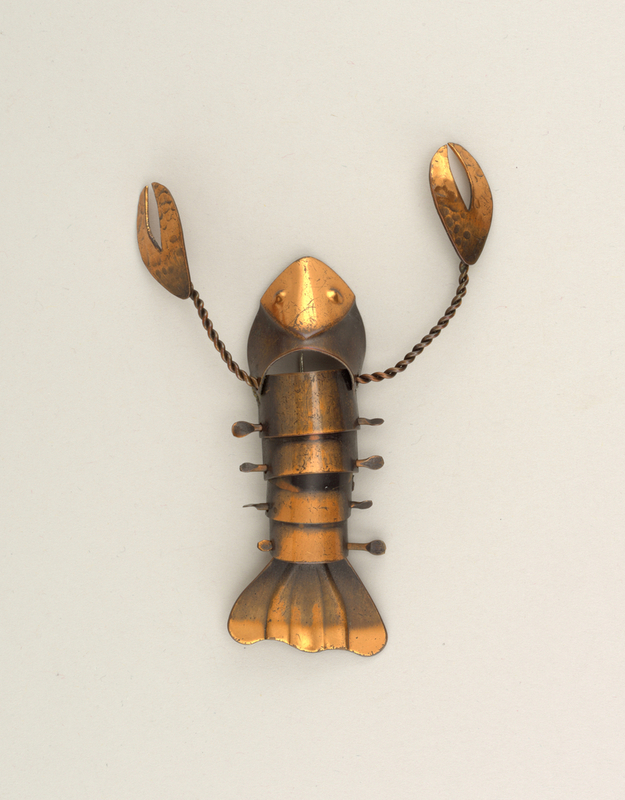 In addition, some pieces were kinetic or had articulating parts such as the body of this lobster brooch made to mimic the movement of the crustacean. Christina L. De León is Associate Curator of Latino Design at Cooper Hewitt. My wife and I have been collecting Rebajes jewelry, lighting, decorative design and wall art for over thirty years. His work is compelling and timeless. We enjoy his presence in our lives every day. a second face on top that lifts up – two faces on a chain. Are you interested? I have a hammered aluminum frame with rounded reliefs embellished on the frame with what the antique dealer said was a picture of Rebajes’ wife in the picture. It’s signed on the back but the signature has different “e’s”. Could this be a fake or could it possibly be a very early Greenwich Village piece? The woman has short hair but looks very art deco. Cole, In this age of the internet I would suggest you do a search of “rebajes sterling leaf”. Your brooch is bound to show up. I did cursory search and found one on etsy. I have a copper Rebaje bracelet with green stones, would you be able to tell me anything about it if I send a picture? Frank Rebajes was an incredible designer. I do find it interesting that his designs are still being made and sadly there is no easy way to distinguish the new from the old. A pity that the current manufacturers of Frank’s designs did not have the foresight to mark them so as to identify what is being made today.